A manager’s primary duty is to help his or her people make their very best contribution to the success of their organization. Sometimes that means correcting deficient behavior or performance. In our last post, Effective Managers Invest in Equipping Their People to Succeed we discussed why effective managers spend 80% of their time equipping their people to succeed. Now it’s time to focus on the remaining 20% of the time when managers need to correct their people back to acceptable levels of performance or behavior. Think of performance management as the manager’s “art and science” of helping employees make their best contribution to the organization. It is not about disciplining people to perform to expectations. That said, performance management starts with hiring and onboarding the right employees. If you’ve made a poor hire, then did a great job training and developing him or her, you still have someone who is a poor fit for the job. This is a very expensive mistake to make, with a high cost to the manager, the organization, and the employee. The Correcting Zone, where individuals who have mastered skills and knowledge correct occasional shortfalls. This is the area where managers and supervisors should spend 80% or more of their time. It is where employees learn and master their craft. Effective managers never skip any of the equipping steps, especially the critical areas of expectations, assigning work, observing performance, coaching and feedback. The equipping step is not finished until the manager has observed his or her employee functioning or behaving consistently over time at a high level of performance. Bottom line here: the manager knows and has observed the employee consistently performing or behaving at or above all established standards. Sometimes problems arise that cause a previously equipped employee to perform or behave below expectations and below the levels previously observed. 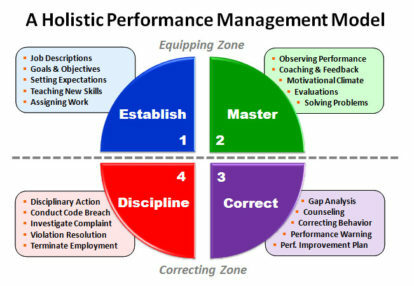 This is the time to enter the Correcting Zone, with the objective of restoring the employee to optimal performance and behavior. Perhaps up to 20% of an effective manager’s time needs to be spent in the Correcting Zone. There may be long periods of time that no time needs to be spent here because of the effectiveness of the manager’s day-to-day Equipping Zone activities. Unlike fine wine, sub-standard performance and behavior rarely get better with age, so wise managers speedily address deficiencies rather than to hope they go away on their own. These five activities associated with the Correct quadrant (3) are typical of corrective activities to restore optimal performance (but not the only ones that could be used here). 1. Gap Analysis is crucial for qualifying and quantifying the difference between the standard and what is being observed. a.	Stating the standard for performance or behavior. b.	Stating what the observed performance or behavior has been. c.	Stating the specific gap between the two. d.	Describing the impact the sub-standard performance or behavior is having on the organization, its customers, co-workers, the department, and you. e.	The requirement to meet or exceed the standard, reminding them they previously did so. f.	A commitment from the employee to do so. g.	Continuous follow-up to assure the employee’s behavior or performance is restored to standard. 3. Correcting Behavior may require a determination if the individual is capable of behaving correctly. 4. Performance Warnings express what happens if performance or behavior is not restored to acceptable levels. Warnings are needed when repeated counseling has not resolved the same issue. 5. Performance Improvement Plans are the formal documents that outline the restorative process, incorporating the issue history and the activities above. 1. Corrective Action is the establishment of performance milestones, which if not met, will result in disciplinary action, up to and including termination of employment. 3. Violation Resolution includes situations where code of conduct violations have occurred, possibly involving unlawful activities, and may involve others (such as coworkers or customers). 5. Terminate Employment is the only recourse for uncorrectable performance or behavior, including certain violations of company policy and law. Correcting unacceptable behavior and performance should be undertaken with the objective of restoring the employee or volunteer to optimal levels. If handled appropriately, consistently, and in accordance with your organization’s policies, most of the time it will achieve that objective. When managers and supervisor diligently and consistently apply the process of equipping and correcting employees, employees and volunteer staff flourish and become more self-directed in executing their assignments and duties, transforming an average business or institution into a high performance organization. This article was excerpted from Boyer Management Group’s award-winning leadership development and sales management programs, Leading Through People Module 6 and B2B Sales Essentials Module 25.